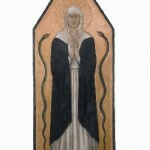 The museum was inaugurated in 1999 and is housed in the premises adjacent to the shrine of Santa Verdiana, the principal place of worship in Castelfiorentino dedicated to the patron saint. In the museum, there are works of art of a very high standard that testify to the local artistic history, which was particularly linked to Florence’s, since from the beginning of the 12th century Florence had dominion over the ancient fief of Castelfiorentino, which was an important political outpost situated on the border with Siena. 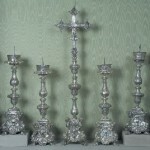 The collection includes numerous paintings, illuminated codices and more than one hundred pieces of silver and vestments, altar cloths and holy vessels made over five centuries. The works come from churches or ancient religious societies around Castelfiorentino, which came to Santa Verdiana after the suppression of some religious orders or to safeguard their preservation. 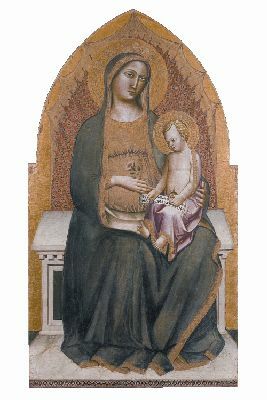 Among the most important masterpieces are to bepointed out: a Madonna with Child attributed to Cimabue, a splendid panel from the end of the 1200’s, for which the critics have theorized Duccio di Buoninsegna as the alternative artist; another tempera on a panel representing the Madonna with Child, painted in the second decade of the 1300’s by Giotto’s best pupil, Taddeo Gaddi and, by the same painter, a polyptych with the Madonna enthroned with Child and four saints. Renaissance painting is represented by various works: such as the Visitation between the Saints Jacopo and Stephen by Alesso di Benozzo, son of the celebrated Benozzo Gozzoli, or the Madonna enthroned with Child and Saints Sebastian and Francis by Francesco Granacci. 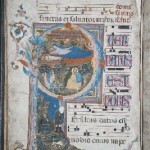 The group of 14th century antiphonaries, illuminated by important artists of the Florentine School active in the workshops of Pacino di Bonaguida or Jacopo del Casentino are of great value. 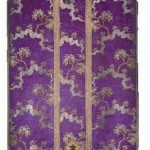 The rich collection of vestments, altar cloths and holy vessels offers an ample repertory of exemplars, starting in the 15th century with the valuable astylar crosses, etched or gilded in copper, up to the chalices and monstrances from the Baroque age to the 1800’s. Museo di Santa Verdiana a Castelfiorentino. Guida alla visita del museo e alla scoperta del territorio. A cura di Rosanna Caterina Proto Pisani. Firenze, Edizioni Polistampa, 2006. 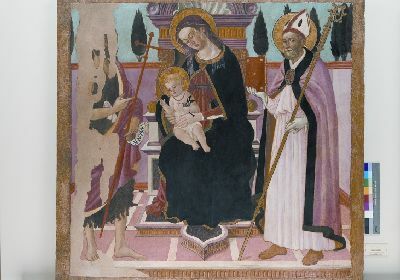 Una via dell’arte in Toscana: il sistema museale della Valdelsa Fiorentina. AA.VV., Firenze, Editore: Edizioni Cooperativa Firenze 2000, 2001. Il Museo di Santa Verdiana a Castelfiorentino. AA.VV., Firenze, Editore: Becocci/Scala, 1999. Size: 169 cm. x 79 cm. 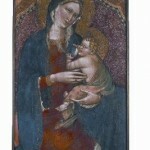 The panel is the earliest and most intelligent re-examination of Giotto’s Ognissanti Madonna. 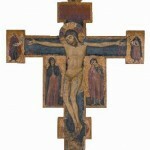 It has been recently returned to the Church of San Francesco in Castelfiorentino from which it had come before being exhibited in the museum. Size: 69 cm. x 51 cm. 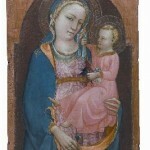 The work is one of the most well-known and important masterpieces of the Florentine Valdelsa. 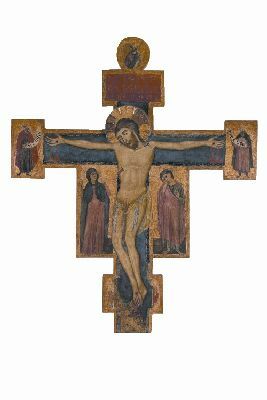 For stylistic reasons, it has been attributed to Cimabue or to Duccio di Boninsegna. 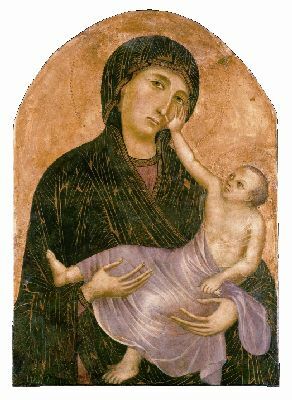 A recent interpretation hypothesizes that the young Giotto also participated in the execution of the painting at a time when he was still an apprentice in Cimabue’s workshop. The work’s original dimensions may have been a little larger. It has undergone various restorations that have weakened the pictorial layer and made it extremely delicate. Size: 88.7 cm. x 172.5 cm. 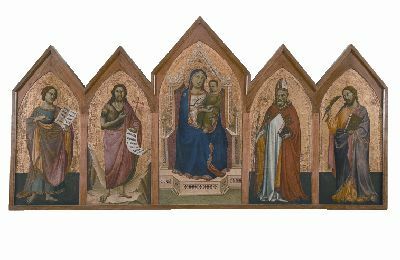 The polyptych is particularly interesting for its early dating as it represents one of the first examples of a large-sized polyptych, rather rare in Florentine painting prior to 1335. 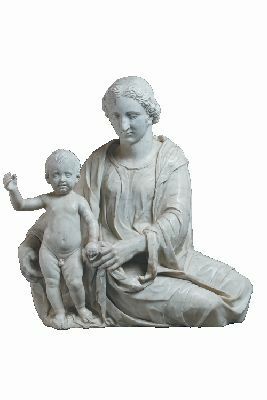 The volumetric rendering of the bodies is to be pointed out together with the individual characterization of the faces and the composition of the Madonna’s cuspidate throne. Size: 76.5 cm. x 47.2 cm. Rossello is one of the painters most representative of the late Gothic style in Tuscany. The painting shows an artistic sensibility that presents a volumetric simplicity of the body far from the Gothic schemes which were still used, instead, for the refined rendering of fabrics and draperies. The work is almost certainly the central part of a polyptych. On the background, only the reddish-colored preparation is left on which the valuable gold leaf was applied. Size: 108 cm. x 58 cm. 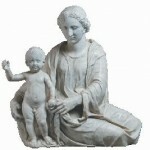 The iconography of the so-called “Madonna of the Milk”, portrayed in the act of nursing Jesus, had a particular dissemination during the 14th century. In this case, the group’s naturalness is underlined by the gestural expressiveness of the two figures. It is probable that the panel was part of a larger work, and it has undergone substantial re-paintings over the centuries. The frontal in painted wood has a background decorated with pomegranate motifs to evoke the effect of the more valuable fabric frontals. In the centre is Saint Catherine of Alexandria, identified by the palm of her martyrdom and by the spiked wheel, represented twice for reasons of symmetry. The choice of this particular martyr is related to the name of the frontal’s purchaser, Caterina Carboni, whose family coat-of-arms is depicted on the side together with that of her husband, Bernardo Cambi. Size: 233 cm. x 59 cm. 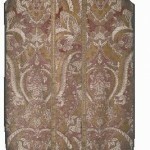 This cloth was usually used to cover the lectern to the ground. 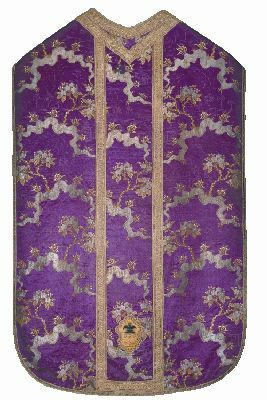 Made of elegant dark green velvet on an ivory background, it is characterized by the ornamental thistle flower motif, which was rather common both for clothing fabrics as well as for sacred paraments. Size: cross: 39 cm. x 26 cm. ; Christ: 7.4 cm. x 8 cm. ; node: h. 25 cm. x diam. 8.3 cm. 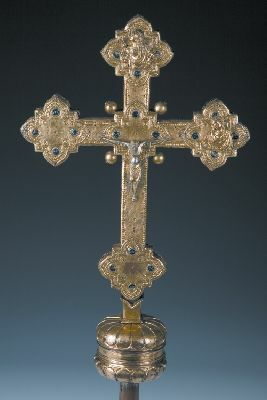 The work is presented with a complex ornamental meticulousness, from the incisions on the gilded copper surface to the small sculpture of Christ, to the tiny casket placed on the back in which the relic is enclosed. 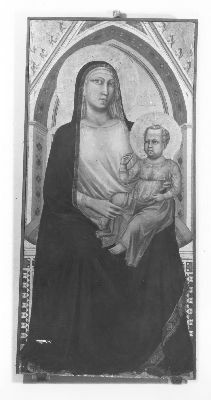 The artist who made it incised his own name and the date as well as making reference to a “Clauductie abbatisse”, i.e., an abbess, which could confirm its provenance from the Monastery of Santa Maria della Marca. Size: 137.5 cm. x 94.4 cm. 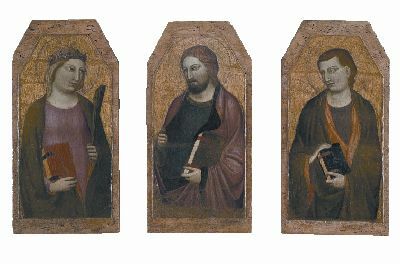 The revival of Michelangelesque motifs transformed by Daniele da Volterra and Sebastiano dal Piombo is apparent, suggesting that the unknown artist spent some time in Rome. Size: 83.5 cm. x 53.5 cm. The Master of the Dominican Effigies is still today an unknown painter, known only conventionally by this name that alludes to a painting with images of Dominican saints kept at the Church of Santa Maria Novella in Florence. However, his style is referable to a group of Florentine painters who probably trained either at Giotto’s school or with some of his followers, as revealed by the marble throne covered in a rich fabric that serves as the background for the sacred group. Size: 172 cm. x 68.5 cm. 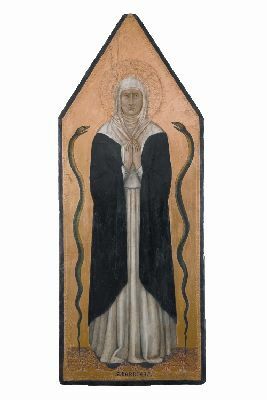 Easily identifiable by the two snakes extended at the sides of the figure, this panel of Saint Verdiana, Castelfiorentino’s patron saint, is today considered the oldest existing painting depicting her. Unfortunately, only the face, headgear, and hands of the figure are original, while the rest is the result of 19th century re-paintings. 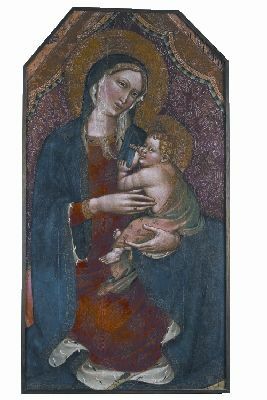 In the past, it was attributed to Cimabue, whereas the artist was probably a Sienese master close to Duccio da Boninsegna’s circle. Size: height 92 cm., base 86 cm. x 28 cm. 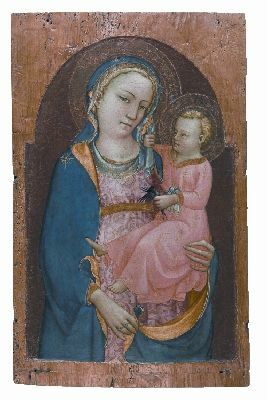 Stylistically the two figures seem unusual and composed of heterogeneous elements: the Madonna’s head is clearly from a different time and of a different workmanship in respect to the rest of the body; even the right hand is considered unrelated to the whole. The figure of the small benedictory Jesus also does not seem to show a coherent execution. Size: 181 cm. x162 cm. The painting is unanimously considered by critics one of the masterpieces by Francesco Granacci who, after working with Michelangelo in the Sistine Chapel in 1508, returned to Florence and followed Fra’ Bartolomeo’s style. 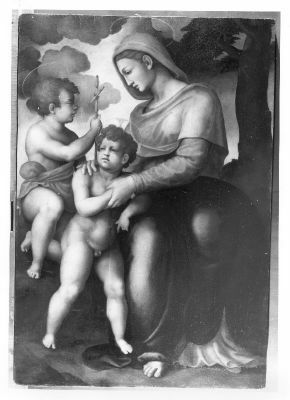 The Virgin is portrayed in the centre with the Child; to the sides are Saints Sebastian and Francis. The whole scene suggests an atmosphere of profound calm and spirituality, thanks also to a knowing use of chiaroscuro. Size: 140 cm. x141.2 cm. 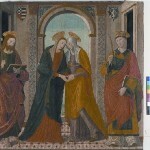 The painting depicts the Virgin Mary informing Elizabeth of the announcement she has received from the Archangel Gabriel. The scene is witnessed by Saint Stephen, identified by the rocks with which he was stoned, and by Saint James, whose stick, knapsack, and shell, symbols of the pilgrim, refer to the shrine in Compostela where the saint was buried. 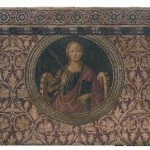 The wedding behind the commission of the painting was that of Jacopo di Scipione of the Alberti Counts of Certaldo and Elisabetta di Antonio di P.
The brocade with a red background takes us directly back to the strong stylistic tendency that, in the 18th century, turned towards the oriental world, bringing together ornamental elements gathered from those faraway repertories in paintings, fabrics, or the various arts. Like the so-called meander motif that uncurls on the plain base of the fabric like a winding ribbon, from which delicate groups of flowers or small bushes emerge, evoking the effect of a stylized landscape, repeated many times on the fabric. Size: cross: 51 cm. x 26 cm. ; Christ: 13 cm. x 13 cm. 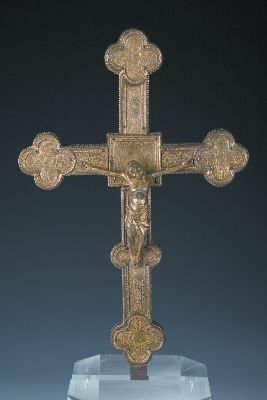 The enamels that adorned part of this valuable cross in gilded copper are lost; the work, however, is a small masterpiece of early Renaissance Tuscan art. In fact, the simple forms of the full relief figure of the Crucified and of the Saint James in relief are now distant from the Gothic models. Size: 480 mm. x 370 mm. This magnificent initial “P” that opens the sentence “puer natus est nobis”, is rendered almost unrecognizable by the dense decoration that is superimposed over the whole body of the letter. The Nativity and the Announcement to the Shepherds are depicted in its interior. 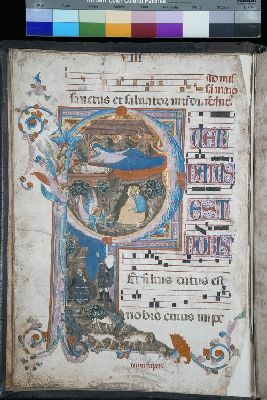 The scene has been attributed to the hand of Jacopo del Casentino, a painter and illuminator who, for this antiphonary, worked together with a still unidentified artist known as the Master of the Dominican Effigies. Size: 160 cm. x 163 cm. The artist abandoned the Byzantine formula of the Christus triumphans, traditionally portrayed with open eyes to signify his triumph over death. Instead, he chose the Christus patiens as the new iconography, aimed at presenting to the faithful an image of Jesus as a man suffering on the cross. Without accentuating the sense of drama and death, the painter clearly moved towards a naturalistic anatomical rendering, learned perhaps from Cimabue’s masterpieces. 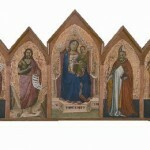 The three panels were originally part of a polyptych, as seen by the different directions in which the saints are turned. It was perhaps dismembered when the painting was transferred to the Church of San Prospero. The style is refined and embellished by elegant Gothic subtleties expressed in the sinuous line of the garments and the meticulous rendering of the chiaroscuro passages. Size: 151.4 cm. x 74.4 cm. 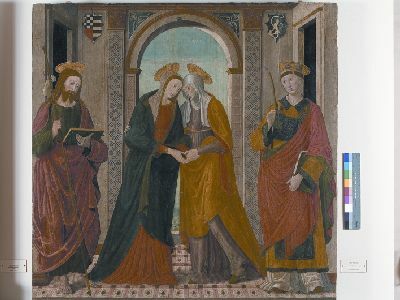 The painting was probably the central part of a polyptych and represents a refined example of the high-quality production of the Florentine workshops active at the turn of the 14th and 15th centuries. Size: 145 cm. x 150.3 cm. 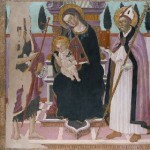 The painting represents the Madonna sitting on a monumental throne. To the left is Saint John with the iconographic symbols of the cross and the cartouche with the inscription (ECC)E AGNUS DEI. 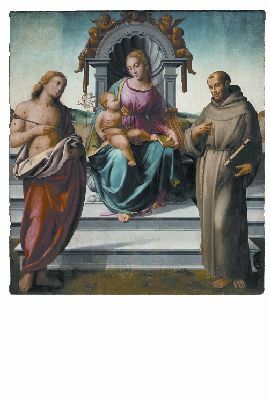 This panel offers a magnificent example of Renaissance Florentine art: the absence of a gold background is to be noted, substituted by a blue sky. A sense of calm pervades the entire scene. 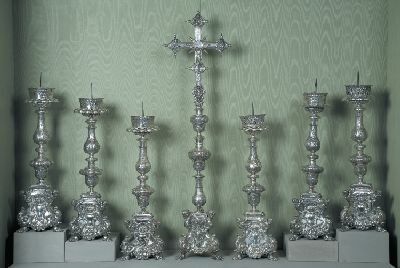 Size: candlesticks: 75 cm. ; cross: 50 cm. x 37 cm. Candlesticks: in the decorative repertoire that softly envelops the surfaces, the typical elements of Foggini’s style are recognizable. Cross: the work looks extremely refined as regards the decoration made up of leaves, garlands and other botanical elements that help frame or are placed beside the figured parts of the side quatrefoil panels: Saint Lawrence, the Benedictory Eternal father, Saint Verdiana, and Mary Magdalene; on the back are the symbols of the Passion as well as the traditional pelican. Size: 113 cm. x 72 cm. 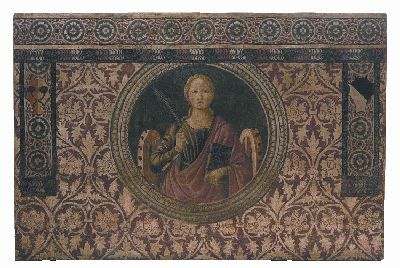 The embroidered cartouche in the lower centre of the chasuble was sewn in 1771 in memory of the donors who offered it to the Shrine of Santa Verdiana: “Carlo di Franco Fagioli e suoi MDCCLXXI”. 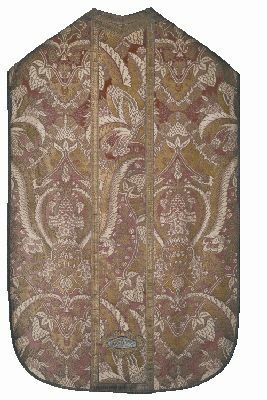 The fabric has been identified as a typical French brocade, datable to between the end of the 17th century and the beginning of the next. Size: 21 cm. x 12 cm. 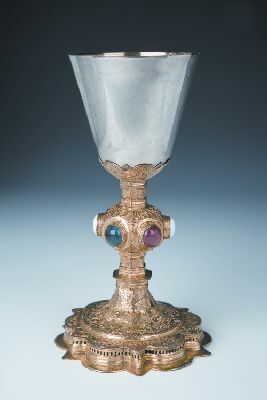 The refined workmanship of the foot and the shaft of this chalice allows an appreciation of the high artistic level reached in the goldsmith’s workshops beginning at the end of the 14th century. The pommel is decorated with pieces of glass in six different colors that simulate mounted precious stones, while the silver cup with a gilded interior has been substituted over the centuries and, in fact, presents a visibly more modern line. By car: driving along the A1 motorway exit at Firenze Signa and take the SCG FI-PI-LI (towards Pisa). Exit at Ponte a Elsa and follow the signs for Castelfiorentino. By bus: from Florence (Piazza Adua), use the SITA bus service. On Wednesday it is open only for schools upon appointment that are made by contacting the Propositura.